Barack Obama’s job approval rating now stands at 55%, up 11 points since January and his highest rating since the fall of 2009, with the exception of a brief period following the killing of Osama bin Laden last year. Obama’s personal favorability rating is 59%, up nine points since early October, shortly after his widely criticized performance in the first presidential debate. Obama also has a wide advantage over congressional Republicans in views of which side is making a serious effort to reach an agreement on the budget deficit. The Democratic Party is viewed more favorably than the Republican Party, and the Democrats hold substantial leads on a number of issues and leadership traits. More say the GOP rather than the Democratic Party holds extreme positions, and far more say that Democrats are generally willing to work across party lines. 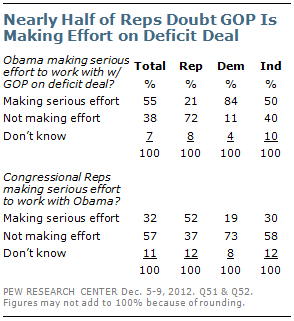 Overall, 55% of the public says Obama is making a serious effort to reach an agreement with congressional Republicans on the deficit; just 38% say he is not making a serious effort. Opinions are about the reverse regarding congressional Republicans’ efforts to reach a deficit deal: Just 37% say they are making a serious effort to reach an agreement with Obama while 57% say they are not. Part of this gap is driven by the views of independents, 50% of whom say Obama is making a serious effort, compared with 30% who say the same about Republicans. But there is also a large difference in how Republicans and Democrats rate their own party leaders’ efforts. While 84% of Democrats say Obama is making a serious effort to work with Republicans in Congress, a much narrower majority of Republicans (52%) say that Republicans in Congress are making a serious effort to work with Obama. The approval rating of Republican congressional leaders remains near an all-time low and has shown no signs of recovering after the debt ceiling negotiations of the summer of 2011. By contrast, approval of congressional Democratic leaders, which also dropped in 2011, has improved considerably since then. Today, just 25% approve of Republican congressional leaders, while 67% disapprove. Approval is up from 21% last December, but remains among the lowest approval ratings in more than 17 years. Four-in-ten (40%) now approve of the job the Democratic congressional leadership is doing (53% disapprove), among the highest ratings for the Democratic leaders over the last several years and up nine points since last December. While just 13% of Democrats and 21% of independents approve of the job the Republican leaders are doing, there is also substantial criticism from within the GOP ranks: Republicans are evenly divided in their assessments of their leadership (46% approve, 47% disapprove). By contrast, Democrats approve of the job their party’s leaders are doing by a 71%-to-23% margin. The current speaker of the House of Representatives and majority leader of the Senate both are viewed unfavorably, on balance. 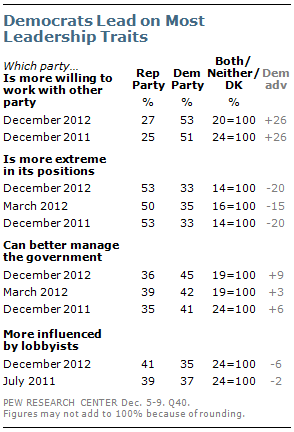 Overall, 40% have an unfavorable view of John Boehner, 28% have a favorable view; 32% do not offer a rating. Views of Harry Reid are similar: 23% view him favorably, 37% unfavorably, and 39% do not offer an opinion. Favorable ratings for both Boehner and Reid have edged up from the start of the year. In January, 21% held a favorable opinion Boehner and just 18% held a favorable opinion of Reid. Independents hold similarly negative views of both Boehner and Reid. Overall, 28% of independents view Boehner favorably, while 39% view him unfavorably. By a similar margin (24% favorable, 39% unfavorable), independents also express a negative view of Reid. Boehner has improved his standing among members of his own party over the past year. Boehner’s favorability is up 10 points (from 36% to 46%) among Republicans. Democrats offer a less favorable assessment of Harry Reid (33% favorable, 22% unfavorable), though he is a far less visible figure. Just 55% of Democrats have an opinion of Reid while 71% of Republicans express an opinion of Boehner. The Republican Party’s favorable rating, which rose in September following the party conventions, has again declined. Just 36% view the GOP favorably while 59% have an unfavorable opinion. In September, 42% viewed the Republican Party favorably and 50% unfavorably, the highest favorable measure for the GOP in more than a year. The Republican Party’s favorable rating is now back to where it was in the aftermath of last year’s debt ceiling imbroglio. And it is nearly as low as it has been at any point in the last 20 years. The Democratic Party continues to be viewed more favorably than the Republican Party, though its image also has slipped since September. 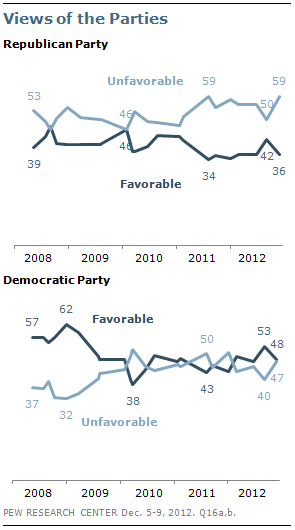 Overall, 48% view the Democratic Party favorably while about as many (47%) view it unfavorably. In September, more held a favorable than unfavorable view of the party (53% to 40%). Nonetheless, current ratings of the Democratic Party are more positive than they were in January of this year and the summer of 2011, when the party was viewed unfavorably on balance. Independents offer a more favorable rating of the Democratic Party (42%) than the Republican Party (30%). 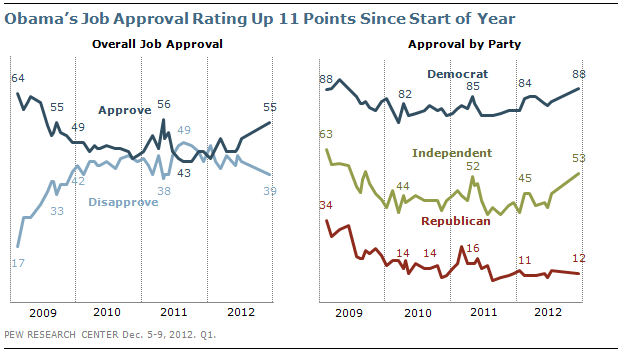 Independents’ ratings of the Republican Party have fallen 11 points since September. Congress remains deeply unpopular with the public. 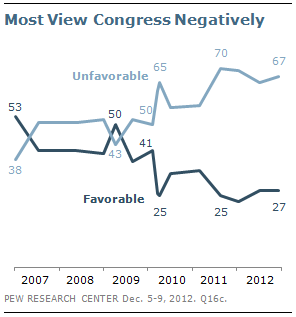 By more than two-to-one, more hold an unfavorable (67%) than favorable (27%) view of Congress. 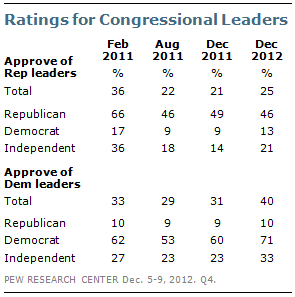 Ratings of Congress are little changed since July and remain close to lows reached in the summer of 2011. Republicans, Democrats and independents all hold broadly negative views of Congress; though Democrats (35% favorable, 58% unfavorable) hold somewhat less one-sided views than do Republicans (25% favorable, 70% unfavorable) and independents (21% favorable, 72% unfavorable). College graduates continue to hold more negative views of Congress than do those with less education. Overall, 79% of those with a college degree view Congress unfavorably, compared with 65% of those with some college experience and 58% of those with no college experience. As in the past, Democrats lead Republicans on several leadership key traits. By about two-to-one, more Americans say Democrats are more willing than Republicans to work with leaders from the other party (53% vs. 27%). Mirroring this assessment, 53% name the Republican Party as the party that is more extreme in its positions, while just 33% name the Democratic Party. The Democrats also have a nine-point edge over the Republicans as the party better able to manage the federal government (45% vs. 36%). And by a six-point margin, more Americans say the Republican Party (41%), rather than the Democratic Party (35%), is more influenced by lobbyists and special interests. The public remains split over which of the two parties can do a better job with two key economic issues – improving the job situation and dealing with the federal budget deficit. On jobs, 44% say the Democratic Party could do better and 40% say the Republican Party. Similarly, the two parties run about even in dealing with the deficit (43% Republicans vs. 38% Democrats). However, the Democratic Party now leads the GOP on several other issues by significant margins. By about two-to-one (53% to 27%), more say Democrats can do a better job improving the education system in the country. And Democrats continues to hold substantial leads as the party better able to deal with Medicare (by 17 points), energy (12 points), health care (10 points) and Social Security (nine points). The Democratic Party also has opened an advantage over the GOP on immigration and taxes. Currently, 44% say the Democrats can do a better job dealing with immigration, while 35% say the Republicans. In October 2011, the balance of opinion was reversed (45% Republicans, 37% Democrats). And Democrats now enjoy an eight-point lead as the party better able to deal with taxes. In July 2011, the public was divided over which party could better handle this issue (43% said the GOP, 40% said Democrats). In July, unfavorable opinions of the Supreme Court rose to their highest level in 25 years, following the Court’s ruling upholding most of the 201o health care law. The current survey shows that views of the court have changed little since then. 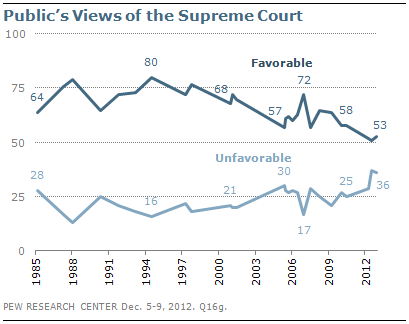 Overall, 53% hold a favorable view of the Supreme Court, while 36% hold an unfavorable view. The wide partisan differences in views of the Supreme Court that emerged in the wake of the health care ruling continue to be evident. Currently, 62% of Democrats have a favorable opinion of the Supreme Court; that is little changed from July (64%), but 10 points higher than in April (52%). By contrast, Republicans continue to express less positive views of the Supreme Court than they did prior to its decision on the Affordable Care Act. Currently, 44% have a favorable opinion of the court, which also is little changed from July (38%). 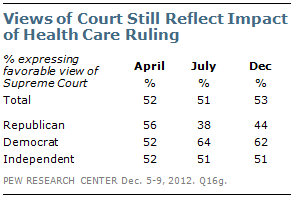 In April, a 56% majority of Republicans had a favorable view of the court. The public continues to hold the military and military leaders in high regard, despite the recent scandal involving former CIA director Gen. David Petraeus. About eight-in-ten (83%) say they have a favorable opinion of the military. A broad majority (71%) also views military leaders favorably, though the balance of opinion is slightly less one-sided than for the military generally. Views of the military are as positive as they were in April 2008 (84% favorable), the last time Pew Research asked the question. Views of military leaders have ticked up slightly from 65% in March 2007. The modest difference between favorable views of the military and military leaders was evident the last time the two items were asked on the same survey in March 2007 – at that time, ratings were 12-points different, the same margin as in the current survey. 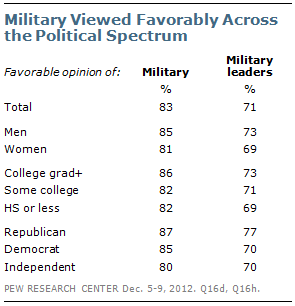 There are only slight partisan differences in views of the military and military leaders. This marks a change from past surveys when Republicans generally held more favorable views of the military and military leaders than did Democrats.